First thing's first: We're mad about beer! 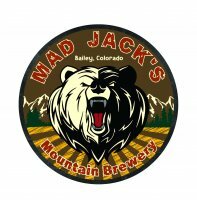 Mad Jack's Mountain Brewery (MJMB) is located in Bailey, Colorado and was formed in 2010 to become a lifelong dream for Jack and Allison (owners). After living 3 years in Germany, they ate and drank their way across the country and were inspired by the German Beers and Beer Gardens. For 15 years, Jack and Allison have made their home in the 285 corridor, a series of quiet bedroom communities from Denver to Fairplay that are growing with the numerous popular tourist activities that the mountain area has to offer. MJMB will provide a product unique to the 285 corridor that could only be found in this area. We have developed recipes over the years that will delight discerning beer drinkers from Denver and the Front Range communities.